The Samsung Galaxy Mega 6.3 is now available in a Purple colour variant in Hong Kong. A report in Unwired View notes that Samsung's Galaxy Mega 6.3 Purple colour variant is now listed on Samsung's Hong Kong website. The site also notes that the Purple variant might be rolled out to other markets soon. The Samsung Galaxy Mega 6.3 global debut in April with White Mist and Black Frost the two available colours. It comes with a 6.3-inch (720x1280) HD display and features an 8-megapixel rear camera while there is a 2-megapixel front facing camera. The phablet is powered by a dual-core processor clocked at 1.7GHz. The Galaxy Mega 6.3 has 1.5GB of RAM, Bluetooth, Wi-Fi and A-GPS. The device comes with a 3,200 mAh battery and runs Android 4.2 Jelly Bean. It includes 16GB of inbuilt storage and has a microSD card for expanding the storage up to 64GB. The site claims that the Galaxy Mega will likely be among Samsung's devices that will be updated to the latest Android 4.4 KitKat soon. Along with the Galaxy Mega 6.3, the South Korean major also launched the Galaxy Mega 5.8 smartphone. 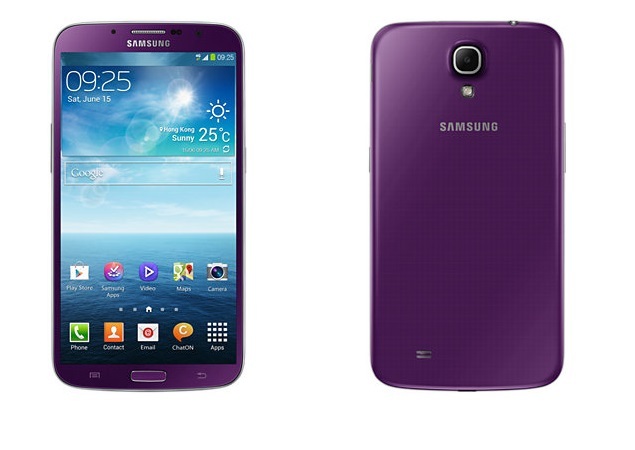 However, there is no word on the Galaxy Mega 5.8 Purple variant yet. Prior to this, Samsung Galaxy S4 was rolled out in Purple Mirage and Pink Twilight colours in Taiwan. Initially, Samsung launched its flagship, Galaxy S4 in two colour variants - White Mist and Black Frost - to which was later added with Blue Arctic, Red Aurora, Purple Mirage, Brown Autumn along with Purple Mirage and Pink Twilight.